Life is full of negotiations — at work, in our relationships and in our purchasing decisions. But what about in our parenting styles? I recently caught up with one dad who’s taking an unusual approach to teaching his kids about money management. And as a new parent myself, I found his ideas fascinating! About five years ago, Bob Helbig began negotiating contracts with his two daughters, now ages 15 and 13. And we’re not talking flimsy verbal agreements here. Of course, I had to talk to him about it. Here’s our interview, lightly edited for clarity. Why did you start negotiating contracts with your kids? On one level, I was inspired by those piggy banks that are divided among spending, saving and giving to charity. But the idea of the contracts stemmed from my background as a union contract negotiator and my interest in personal finance. I guess I’m playing the management role here. In most everything in life, I see value in having conversations, planning and creating clear expectations. The kids and I have an understanding that the money they earn from their allowances is their spending money, which they have earned. They know they aren’t going to get any extra cash from us beyond that. They are welcome to earn money babysitting for neighborhood families or doing other work outside the house if they choose. How have the contracts evolved over the last five years? We generally renegotiate every year or 18 months. Over the years, the girls have gotten raises and sometimes the chores change. Also, the penalties have changed based on their ages and our expectations. For example, one of my daughters had a habit of leaving her lunchbox at school, so we wrote that into the contract that year. We hear a lot about the importance of learning to negotiate, especially for women. What have your daughters learned through this process? They are not afraid of speaking up for themselves. That in itself has huge value. They know that if they want more money, they better come armed with reasons why they deserve it. There’s definitely value in having upfront conversations about what they are willing to do and what they feel their time and effort is worth. Some jobs are harder to persuade them to do than others. Neither girl likes the job of sorting and pairing the socks. I have also been sensitive to the fact that not only do costs rise, but kids’ expenses rise as they get older. So they have gotten not only “cost of living” adjustments but also allowance increases based on their responsibilities. Does the contract include incentives for getting the kids to save some of their money? Yes, we match the amount of money they save each month. There’s definitely been some back and forth around when or how much they can withdraw from their savings, but ultimately we’ve left that up to them. The kids will sometimes talk about wanting to withdraw money to go shopping, for example. I urge them to plan long term about saving and to think of that money as not for everyday expenses or splurges. My hope is that someday they will look back and realize: Wow, that discipline of saving really paid off. How flexible are you on the contract, especially around chores? Enforcement is up to me. It’s one of the perks of being the parent. I’m a stickler about some things, like forgetting to take out the garbage. That’s an automatic deduction. Some things I might let slide, like forgetting to make the bed for a day. But if I see patterns of inattentiveness, I’ll make an issue of it. The same as any employer would do. How do your kids feel about this approach to money, especially compared with how their friends’ families might approach allowance? Our girls will sometimes tell us that some of their friends get more spending money from their parents. We just reply that’s not how we do things in our house. The upside is when they see their monthly balance in their savings account. They know they probably have more money saved in their own name than their friends do. My older daughter has saved more than $2,000 between her own money and the funds we’ve matched according to the contract. How do you encourage your kids to donate to charity? Each week, the girls are required to set aside 50 cents of their allowances for charity. Every six months, they choose a charity to receive the $13 donation they’ve saved up. I kick in $37 for an even $50 donation. It’s important for kids to understand that there are many people in need and many worthy causes. I want our daughters to know that there’s a world out there much bigger than themselves. When it’s time to choose which charity to donate to, I encourage my kids to find a cause they care about and do some research on the foundations working to make a difference. 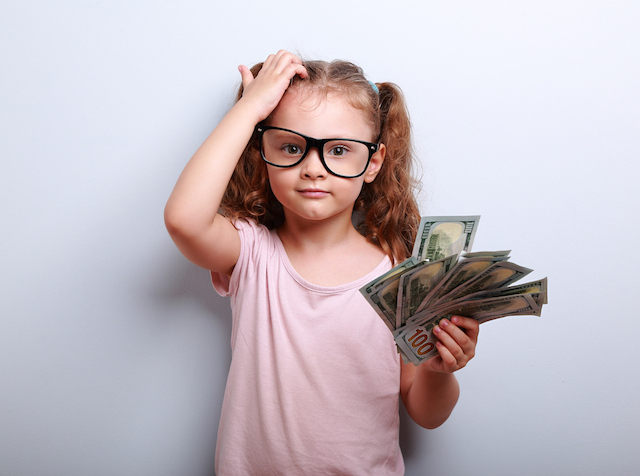 Why is it important to teach your kids good habits around money? Once our kids are adults, how they handle money will be out of our control. For now, they are finding motivation to earn money and some discipline when it comes to handling money. They see the value of a dollar, the importance of saving money and the need to spend within your means. Ready to draw up a contract with your kids? Here’s a copy of Bob’s most recent contract with one of his daughters. Your Turn: What would you add to this contract? Lyndsee Simpson is a writer and editor living in Washington, D.C. She should probably negotiate a contract with her cat to spell out expectations around chores and hairballs.